Miswak is a special type of tooth-cleaning twig that is used as tooth cleaning brush without use of any paste. Take a fresh miswak twig, equal to the size of your regular tooth brush. Now trim or chew the bark off one end of the stick; about a 1/2 inch. Chew on the exposed end until the twig forms bristles. Brush your teeth as usual and no toothpaste is required. Natural antiseptic and antibiotic qualities of neem are very helpful to prevent many gum diseases, cavities and oral odour. Break a small branch of the neem plant. Break or cut the tough edges of one side of the stick. Now chew this side of the stick. All the fibres will separate and the end will turn into a little brush and gently brush your teeth with it. The neem toothbrush is disposable, meant to be used only once. After teeth cleaning, spit out all the little bits of neem fibre and wash your mouth with normal water. Mash some mint leaves and then add sea salt in it. Use this mixture to clean your teeth with the help of your index finger or a moist tooth brush but avoid harsh brushing because harsh brushing my damage your tooth enamel. A combination of mustard oil and sea salt is also very helpful to give your teeth a sparkling shine. Take half a tablespoon of mustard oil and a pinch of salt in a small bowl. Mix them well and then use this combination to brush your teeth. Gently brush for 3-5 minutes and then wash your teeth with fresh water. Make a mixture of baking soda and lemon juice and brush your teeth with this mixture but avoid harsh brushing because harsh or over brushing with salt and baking soda may damage tooth enamel. You can also make a mixture of salt and lemon juice and brush your teeth with this mixture. This mixture is best to remove the yellowish tint but avoid over brushing. Cloves are also very beneficial for natural teeth cleaning. Take some clove powder and gently brush your teeth with it. Continuously brush for 3-5 minutes and then wash off with normal water. 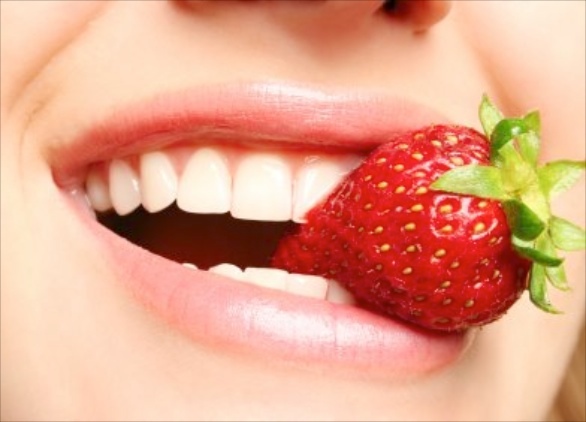 Strawberries help polish teeth and keep them white and shiny. They not only kill plaque causing bacteria but also work great to remove stains from teeth. Make a mixture of one mashed strawberry and half teaspoon of baking soda. Using a toothbrush, apply the mixture to your teeth and let it stay for 3-5 minutes. Then rinse and clean your teeth with a regular toothbrush to completely remove the mixture because strawberries are acidic and may damage tooth enamel if allowed to remain on the teeth too long. For best results brush your teeth with this mixture once per week.